Chris DeVolder, AIA, LEED AP, WELL AP, is the managing principal of HOK’s Kansas City office. As the sustainable design leader for the Sports + Recreation + Entertainment practice and co-chair of both the Green Sports Alliance Corporate Membership Network Steering Committee and the USGBC’s LEED User Group for sports venues, he has helped reinvent the industry’s approach to the planning, design, construction and operations of sports venues. Here Chris shares his ideas about designing these community pillars for sustainability and resilience. How did you get interested in sustainable design? Chris DeVolder (CD): Twenty years ago I was playing drums in a band made up of Kansas City architects. The lead singer was passionate about sustainability and was working on a sustainably designed residence for a client in his free time. He asked if I’d be interested in helping with his project. That moment changed my career. He gave me a copy of “The Sacred Balance” by David Suzuki that, coupled with his mentorship, fueled my passion for sustainable design. You have dedicated your career to designing sustainable college and professional sports facilities. How has sustainable design in sports evolved? CD: Three things were happening when sustainability made a splash on the sports scene. First, jurisdictions and campuses had begun to require LEED certification for new buildings. Second, there was an influx of organic, student-driven movements around campus recycling that athletic departments supported. Third, operators of these massive sports facilities began to look at their rising water and energy consumption and felt motivated to change. About this time the Green Sports Alliance was founded. At the organization’s first conference in 2010, most presentations were case studies of buildings that had upgraded their water and energy efficiency. We’ve come a long way. Today’s proactive owners and operators are seeking innovative strategies around community, food and renewable energy. Sustainability was once a completely cost-driven decision for owners and operators. Now there’s also a moral component. Our clients have a better understanding of opportunities to use these facilities to support campuses, neighborhoods and cities. Why is sustainability in sports so important? CD: Our stadiums, ballparks and arenas are highly visible buildings that are accessible to the entire community. They provide an incredible opportunity to teach people about sustainable design. The first thing many of us do every morning is check sports headlines and scores. With our unwavering loyalty to teams and universities, sports has a unique platform to communicate sustainability and change behavior. How does this visibility affect your approach to design? We encourage clients to find strategic partnerships that support their broader sustainability goals. 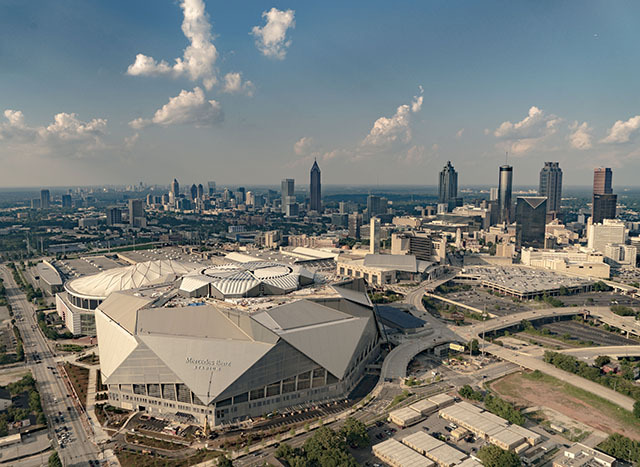 For example, Mercedes-Benz Stadium, which achieved LEED Platinum, partnered with Georgia Power to integrate more than 4,000 solar PV panels. Every year they generate enough energy to power nine Atlanta Falcons games and 13 Atlanta United matches. Read the full interview on HOK’s website.